As I was surfing my favorite news sites and blogs, I came across a frightening report. With the Supreme Court decision on Obamacare looming over us, you can feel the fear and anxiety throughout the medical field. 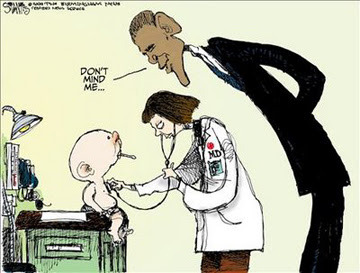 According to a recent survey by the American Medical Association, an astounding 83% of doctors stated that they would consider leaving the medical profession, should the unconstitutional law go into effect. 7) Private Practice is being replaced by Corporate medicine .... and more. So, where would that leave us? I watched a daytime news show last year that interviewed an audience of doctors. Half were newly graduated from Medical School, while the other half were seasoned and veteran doctors. The difference in philosophy between the two groups was astounding! The young doctors think the new system will provide "equal access" to all people, and think working for Big Brother poses no ethical or practical problems. (Brain-washing in the medical school classroom is no different than at other universities.) The older doctors clearly see a decline in the quality of medical care when decision-making is made by "panels" and "committees" versus treating the individual as needed. And now I'll answer my own question.... I think if Obamacare becomes a reality and we lose 83% of our "old-school" doctors, we will suddenly find ourselves in a "Brave New World". You will just be a number in the medical system, seen by whatever physician happens to be on call at the clinic you report to. No longer will you have an intimate and personal relationship with your doctor, and your wait-time for an appointment will be extended considerably. I feel for all the physicians who entered into this profession for all the right reasons. How it must break their hearts to think that the Government will control the quality of life of their patients. No longer will the physician/patient relationship be paramount! And they endanger their livelihood (and their freedom) should they decide to buck the system. I can understand why, even though it would be extremely difficult, they would rather leave their profession than deliver a substandard caliber of care. As a patient, I must admit that my opposition to Obamacare stems from more than the financial aspect of health insurance, long wait-times for elected surgeries, or so-called "health panels" that will determine aspects of my life-giving care, or even the circumstances of how my life will end. My real concern is the relationship I want to have with my doctor. I want someone attending me who knows me --- my name, my history, and how I wish to be treated..... and cares about hearing my opinions. The thought that I could be facing a future with Government-employed practitioners turns my blood cold. So you can bet that I will be praying that the Supreme Court follows the Constitutional rulebook, and strikes down the mandate. Our nation needs healing -- and by those who know the true meaning of restoring us to health. Jeremiah 8:15 "We hoped for peace but no good has come, for a time of healing but there is only terror." Speaking from personal experience, the government is in the exam room and needs to get out ASAP. That being said, I don't see it happening. And this has been occurring since BEFORE Obamacare, but now it is many times worse. I don't know about the validity of these statistics, but that is beside the point, doctors and many other healthcare providers are becoming more & more frustrated in just trying to take good care of people and having their decisions questioned every step of the way. The doctor-patient relationship is going down the tubes as each day goes by, it's now wonder physicians are thinking of bailing out....and we all suffer, because one day they will be patients too! If Obamacare doesn't get repealed, and physicians quit, I suspect many will go "underground" so to speak, and will continue to do what they do best, but maybe in a more creative, almost black market sort of way, and that is not necessarily a bad thing. Of course this is just one person's opinion. I applaud the doctors who recognize how the "system" is damaging the care their patients receive, and will find some way to provide good quality medical care. In the meantime, the American population needs to do all it can to get healthy and take care of themselves.